Wednesday’s session remained a day for severe consolidation for the Markets. The Markets saw a negative opening, dipped lower in the first half of the session and then recovered over 75-points from the low point of the day. The NIFTY still ended the day with minor loss of 15.95 points or 0.15%. NIFTY continued to consolidate near its 100-DMA and has also deliberated there and halted its pullback on expected lines. Currently, it remains in a trading zone without any directional bias and it is likely to remain this way for some more time. 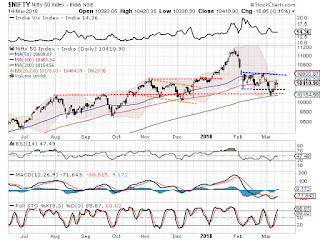 As we approach Thursday’s trade, the way the NIFTY is unlikely to breach its pattern low of 10275-mark, it is also unlikely to give a runway up move. In all likelihood, it may continue to consolidate before it prepares to move past the 100-DMA which rests at 10458. The levels of 10450 and 10485 will act as immediate resistance levels for the Markets. Supports come in at 10365 and 10320 zones. The Relative Strength Index – RSI on the Daily Chart is 47.4862. This indicator remains neutral showing no divergence against the price. The Daily MACD stays bullish as it trades above its signal line. A long lower shadow occurred on Candles. However, in the present context and looking at the place it occurred, it remains insignificant to draw any conclusions for it. The pattern analysis continues to show NIFTY in the trading range. This range is formed with the lower range support of 10275 and upper range extending itself 10600 with the levels of 100-DMA lying exactly in between. Overall, it is beyond doubt that the NIFTY tested its 100-DMA and showed minor corrective tendencies after that. However, it clearly continues to exhibit the underlying positive bias. Also, the broader Market Indices have continued to show resilience while the sectors chose to consolidate. We expect such range bound consolidation to continue. 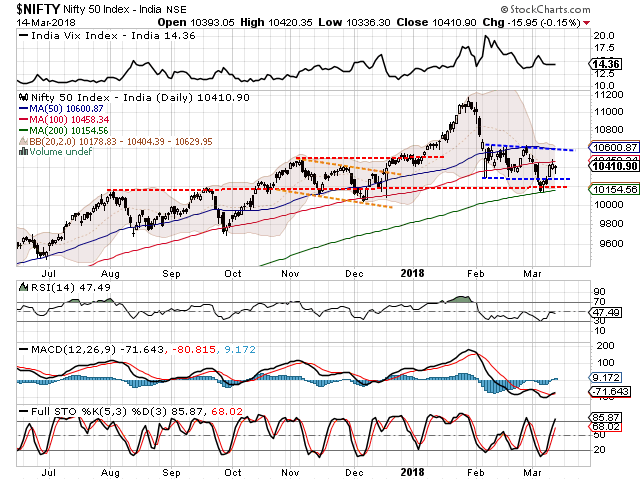 However, we also expected that despite some amount of volatility and some continued consolidation, there are greater chances of NIFTY moving past the 100-DMA mark at close in short time. We continue to reiterate a cautious but positive outlook in the Markets for the immediate short term.